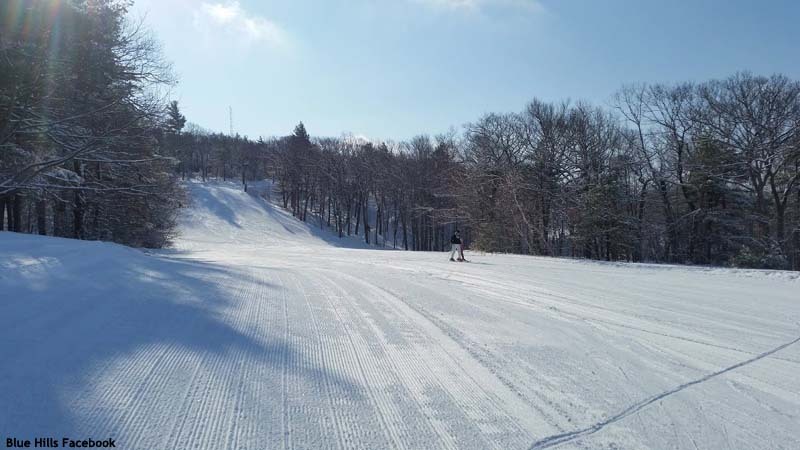 Located south of Boston on the highest coastal region peak in the state, Blue Hills ski area has provided lift served skiing for over half a century. In 1884, Abbott Lawrence Rotch established the Blue Hill Meteorological Observatory at the summit of 635 foot Great Blue Hill. Nine years later, Massachusetts purchased a massive tract of land that would make up the Blue Hills Reservation. The Blue Hills Reservation quickly became a recreational hotspot. The original center of winter sports activities in the Blue Hills Reservation was located in Quincy. Named after the location of the 1928 Olympics in Switzerland, the "St. Moritz of the South Shore" was dedicated on January 27, 1929 at a ceremony attended by 15,000 people. Included in the facility were ponds for skiing and a ski jump. The St. Moritz area was widely popular in its early days, hosting numerous gatherings and jumping competitions. The 1931 winter carnival attracted between 50,000 and 75,000 spectators. While tens of thousands continued to visit St. Mortiz, the Civilian Conservation Corps was developing two alpine trails ski trails on Great Blue Hill. Charlie Proctor was involved in laying out the Number 1 Trail. In 1949, the Metropolitan District Commission was given $65,000 to develop a ski area on Great Blue Hill. Cranmore's Hannes Schneider was hired to oversee the construction, which included two trails and a novice slope, served by three electric rope tows. The tows were built by Walter Stadig, who had recently built the chairlifts at Thorn Mountain, NH. The Number One Trail and novice slope at "Little Cranmore," as Schneider referred to it, were lit for night skiing. The new area reused dramatically widened versions of the original trails. A pair of rope tows served the trails in tandem, while a separate tow served the 6 acre novice slope. While the area was supposed to open on Christmas Eve of 1949, poor weather and a lack of parking resulted in a postponement. After a lengthy snow drought, Blue Hills finally opened on February 16, 1950 with less than 100 skiers. Additional state funds were used to improve the ski slopes for the 1950-51 season. The ski area was renamed to the William F. Rogers Slopes that season, in honor of the Braintree Town Moderator and former Appalachian Mountain Club President. Unfortunately for area skiers, 1950-51 was once again a poor winter, resulting in less than 10 days of operation. The state poured another $30,000 into the ski area for the 1951-52 season, as drainage was improved, trails widened, and additional lights installed. A February snow storm resulted in the ski area being 'sufficiently covered' for the first time. The winter of 1955-56 proved to be one of the best on record, as the ski area remained in operation through March 29th. In early 1962, plans emerged to expand the ski area in terms of size and operating season. Sel Hannah's Sno-Engineering, Inc. was hired to design development. The Metropolitan District Commission allotted $140,000 to install snowmaking and $75,000 to construct a chairlift. In addition, the existing pair of trails were widened, while a third trail was cut. 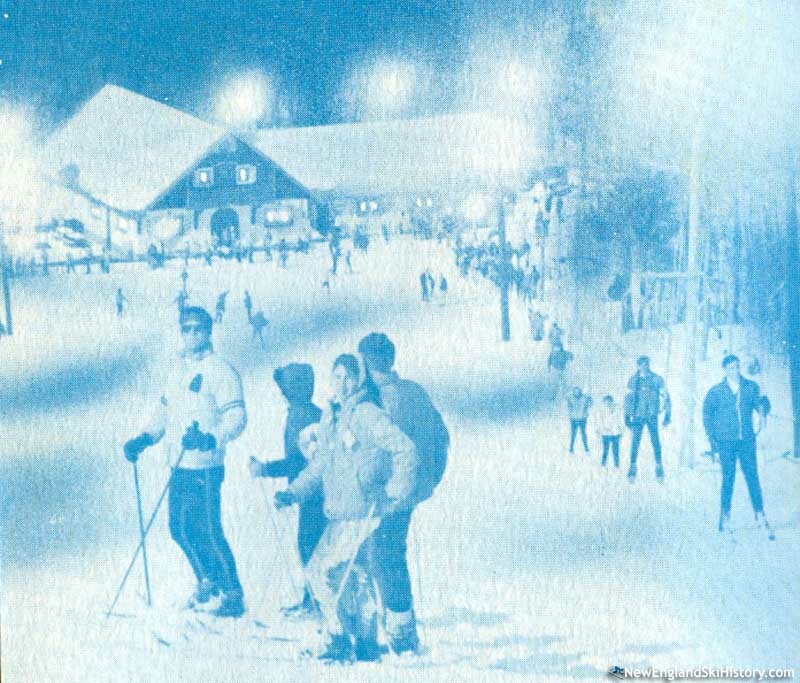 In December of 1962, the Metropolitan District Commission awarded a 10 year lease of the ski area to Larchmont Engineering Co. Larchmont, which had recently been awarded the snowmaking system installation contract, was responsible for building a base lodge and operating the ski area. In addition to building a base lodge, Larchmont would also have to pay 5 to 50 to percent of its gross to the Metropolitan District Commission. The snowmaking installation was used immediately, as it allowed Blue Hills ski area to open that month despite minimal snowfall. The ski area was able to operate for some 70 days that season. Joe Tropeano served as President of the operation, while Sonja Loew (ex-wife of theater owner E.M. Loew) served as Vice President, keeping close tabs on the restaurant operations. Additional big changes were in store for the 1963-64 season. Pursuant with the previous year lease agreement, a new base lodge was constructed. In terms of the lift network, a Mueller double chairlift was finally installed, along with a Larchmont J-Bar (a second J-Bar likely was completed for 1964-65). Meanwhile, Olympic Silver Medalist Penny Pitou and her husband Egon Zimmermann took over the ski school. Blue Hills became so popular that, on one day in January of 1965, 3,200 skiers were recorded, resulting in 2 hour lift lines. The expansion and Larchmont management of Blue Hills was considered such a success for the state that it was used as a model for potentially leasing out Wachusett. The leased incarnation of Wachusett would later go on to become one of the most popular ski areas in New England. In January of 1966, Senator Edward Kennedy made a splash in the local media when he chose Blue Hills for his first post-plane-crash ski day. Using its prime location to its advantage, Blue Hills launched various midweek programs, such as lessons for housewives, local school racing, college racing, YMCA programs, and YWCA programs. Other than the replacement of the Mueller double chairlift with a new Hall double chairlift in 1978, Blue Hills remained roughly the same size throughout the 1970s. After some two decades of running the ski area, Larchmont handed over the reigns to brothers Robert, Stuart and Stanley Beers in 1982. Joe Tropeano passed away in 1985. While the Beers were granted a 5 year lease, the state went to an annual renew model starting in the late 1980s. Without any guarantee that they (or any other prospective bidder) would have the area for more than a year, the Beers were unable to obtain financing for any significant capital projects. Bankruptcy filings and second mortgages resulted, frequently putting the ski area in jeopardy. In August of 2000, a six year lease was granted to the then-owners of Ragged Mountain, NH, the Endriunas Brothers. For their first season, the Endriunas Brothers expanded snowmaking and added a new magic carpet lift. A new rental building was constructed for the 2001-2002 season. The Endriunas Brothers hit tough times during the 2006-2007 season, resulting in a brief closure in early 2007 when their liability insurance was cancelled. The area reopened that winter, however Endriunas Brothers soon left the ski business. The operators of Campgaw Mountain, NJ signed a 5 year lease in late 2007 under the name of Ski Blue Hills Management LLC. For 2008, a new magic carpet lift was installed, as well as additional snowmaking equipment. In August of 2013, Campgaw announced it had received the contract for another five year lease of the ski area. With abundant snow in Southern New England during the winter of 2014-15, Blue Hills enjoyed a strong season which extended into April. Thanks to improved snowmaking, the ski season nearly extended into April again in 2018. "I learned to ski at Blue Hill through their after school program (late 60’s/early 70s’s) Busloads of us kids would arrive for our weekly lesson from 4pm to 6pm on weekdays. A couple of years later we moved just down the street from Blue Hill. We would go and ski after school till they closed at 6pm. In those days on weekdays they would be open during the day till 6pm, then close for an hour, and re-open from 7-10pm. On weekends we would ski during the day - they were open til 4:30pm on weekends, and then again when they re-opened for the evening 7-10pm session. I remember the Blizzard of ‘78. The roads were closed to normal traffic, but the ski area was open and were were able ski with no crowds all over the hill - on-piste and off-piste for days afterwards. Unfortunately later that season is when the double chair broke down and couldn’t be used, and the only way up the hill was the J-Bar which ran up the left side of the main slope. Their one snow cat also broke down toward the end of the season, which ended grooming and led to moguls covering every trail. The chair was replaced for the following season. I do remember seeing plans for expansion that included a second chairlift, but nothing ever came of it. In the late 70’s early 80’s I was a ski instructor there under Hans Siesel, while in high school. There was a rule that as ski instructor, if you were caught falling down on the hill, you owed the ski school a case of beer…. Did this happen to me? Well, maybe…. I did return briefly as a ski instructor in 2012-13. I have been back since usually once a season for an evening or half day or skiing. Lots of memories there….. "
"As an elementary school student growing up in Stoughton, I learned to ski here through the after school program. In 1987 at the age of 17 I started working as an instructor under Hans Seisl and Bruce Livingston. I continued to work part-time through college. In 1994 I began training and working with the Blue Hills Ski Patrol under Karl Johnson, patrol director at the time. In 1998, I began dual patrol duty working weekends at Wildcat Mountain in NH. In 2005, life took me to Colorado and I patrolled at Arapahoe Basin and Copper Mountain. I am now the Risk Manager for Copper Mountain and have made the ski industry my career. Thank you Blue Hills for helping me find my true passion in lift." "The palms of my leather mittens would be literally smoking after trying to keep a grip on the old rope tow!" "Does anyone remember the year someone designed rollerblades on skis and the blue hills opened for the summer? Around late 60,s early 70,s. They had ski patrol and the lift running. Skis were very heavy, and falling was all scrapes and bruises." "Our car could almost drive itself to Blue Hills Ski area we went so often in the 70's and 80's. I was always happy when I could find time to bring lunch picnics there for our 8 kids. " "Blue Ice! I remember it as if was yesterday. Larchmont Engineerings first iteration of snow making was touch and go. More often then not there was more water then air spraying out of those nozzles...but it was a start. It was a real blessing for the warm weather ski areas. I recall one of there first installs was at Boston Hill in Andover during the late 50's. It was always great to live so close to Blue Hills. My wife and I lived on Mission Hill in Roxbury during the mid 60's. We called it the subway ski area...as you could take public transportation. We skied there several times at night. The view was great. Glad to see your still operating after all these years." "I have been bringing friends and family to the Blue Hills Ski Area since 1975. 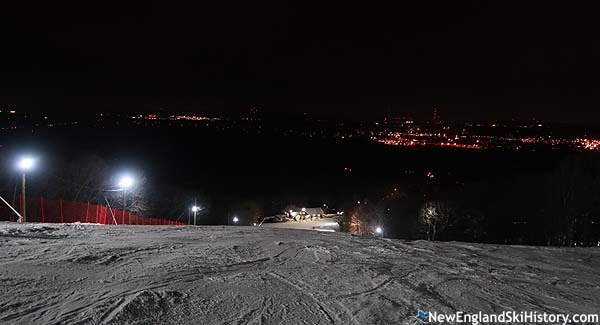 It is a family friendly ski area with a great view of the Boston Sky Line at night. Thanks to the excellent training I received from Blue Hills Ski School Director Hans Seisl and Assistant Director Bruce Livingston I am currenly a part time ski instructor at this wonderful area. My daughter Hope has also taught at the hill, and my daughters Faith and Joy often help with the younger skiers. My ten grandchildren always look forward to their weekly ski lessons with wonderful instuctors such as Betsy, Mike and many others."